"My name is Dr. Maas. For many years I accompanied my detective friend, Mucus Stools on his adventures. I remember the Mulch Family Caper well. My friend was visiting me in my flat on Boulevard Street when I heard the telephone ring over Stools playing his spoons and huffing airplane glue. "Hello, this is Dr. Maas." "Eating your dinner, Dr. Maas?" "No, that is my friend Spoons playing his stools." "Can you come over and see Lester? He's really bad this time. I am afraid we may lose him. He sometimes hides under the bed." "I'll be right there Mrs Mulch. Mind if my friend, Mucus Stools comes along? He's visiting and I could use his help if we have to pull Lester out again?" "Not at all. Hurry!" CLICK! "Stools, come with me. I have no idea why Lester has taken a turn for the worse the past few months. Maybe you can help me out." "Sure Dr. Maas. Want me to carry that black bag and open the door? Better watch the stairs." "No. No. I mean to accompany me over to Lester Mulches residence." Upon arriving at the Mulch home, I rang the bell and a rooster crowed." "Ahh", stated Stools. "This reminds me of the dog that did not bark in the night." "It's the doorbell." Suddenly a young lady opened the door and showed us in. "Just take a high step over the threshold there, gentlemen. Mother is upstairs in the bedroom with Stinky." "Not me. Must be your friend. Mom and Dad's room is right at the top of the winding stairs. Just knock on the door when you get to the top of the stairs. Can't miss it. It's the only room up there. There's only one door." "I'm sure we'll find it." Upon reaching the top of the stairs we windedly knocked on the door in front of us and it was opened by Mrs Mulch. "Oh come in, Dr. Maas. Lester can't last long. We have been changing his adult diapers every hour since a week ago Wednesday." "Oh yes. Of course we still have to blend it. Just yesterday I fixed his favorite, barbecue ribs and corn on the cob." All at once, Lester stiffened, raised his hand and gave up the ghost! I rushed over but it was too late. "Prize his other hand from the ghost", stated Stools. "The poor thing is frightened to death." Just at that moment the daughter arrived! "You must overlook my daughter, Dr. Maas. She has been changing his diapers for the past six years." The daughter then danced around the bed doing some mystic ritual while singing about a "dead Ding Dong!" Much later, after the services for Lester, I noticed Mucus Stools talking to Mrs. Mulch in a low voice. "Sorry about the laryngitis. But you poisoned Lester didn't you? I won't tell." "Yes, but you will never prove it." "Don't worry. Just wanted you to know that I know so that you would know before...I forgot." "Lester was driving us crazy. 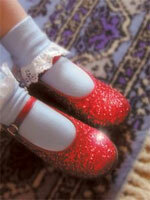 My daughter had taken to wearing ruby slippers! We both needed a new life. I burned all the evidence." "A little poison in the baby powder. Lester couldn't have lasted much longer anyway, Mrs. Mulch. Doc tells me the autopsy showed he had hemorrhoids a foot and a half long." "But remember lady. Detective Mucus Stools will always keep one eye on you."